420 pages | 20 B/W Illus. The short, thematic chapters are bolstered by the inclusion of relevant primary documents – many translated for the first time – including advertisements and posters, song lyrics, political speeches, government documents, and more. Each chapter also includes timelines highlighting important dates and suggestions for further reading. Richly informative and highly readable, Latin America since Independence provides compelling accounts of this region’s past and present. This second edition brings the story up to the present, with revised chapters, new primary documents and images, and a new ‘At A Glance’ feature that uses a selection of maps and tables to illuminate key issues like the economy, the environment, and demographics. 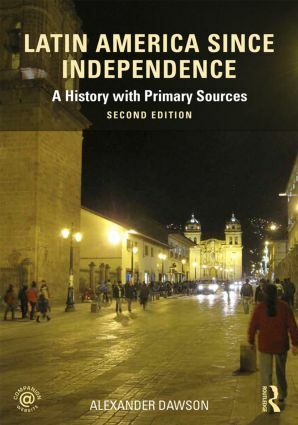 For additional information and classroom resources please visit the Latin America since Independence companion website at www.routledge.com/cw/dawson. "Dawson writes with marvelous insight into Latin America's grand themes, capturing broad patterns concisely and challenging preconceived notions. This is a book that will deeply inform newcomers but also lead more advanced students to reconsider their understandings of the region. The well-chosen documents enrich the text and facilitate open debate." "Latin America since Independence pursues a thematic approach to understanding modern Latin America that loosens chronological moorings without casting them aside. It is custom-built to facilitate discussion about the ways in which history is actively and interminably constructed over time. This revised edition has preserved the best features of the original while expanding an already robust collection of primary sources. New images, charts, and chapter inserts make Latin America since Independence a dynamic complement to lectures in the undergraduate classroom." Alexander Dawson is Professor of Latin American History at Simon Fraser University, in British Columbia, Canada. He is the author of First World Dreams: Mexico since 1989 and Indian and Nation in Revolutionary Mexico.